We can significantly reduce the time it takes you to complete RSMeans line item estimates, improve accuracy, and provide you with a single program allowing your entire team to collaboratively manage multiple contracts. We can help your team estimate not only faster, but more accurately. Create Estimates in Minutes vs. Hours and Hours vs. Days: Easily reuse and Share Estimates with our Estimate Clipboard (copy, paste, and update estimates and line items within a collaborative platform). Manage Multiple Contracts and Projects in One Application: JOC, SABER, IDIQ, MATOC, Etc. Document Management: Stop Reinventing the Wheel with Every Estimate. Store all of your Active and Inactive Estimates within a Single Program. Use your Previous Estimate as a Template for your Next. Truly Extraordinary Training Classes: Led by Former DOD Estimators and Project Managers with Decades of Experience Estimating with RSMeans. 4Clicks Solutions, LLC is a certified veteran-owned small business that develops and markets the leading DOD construction cost estimating and project management software product. e4Clicks Project Estimator is used by over 85% of United States Air Force Bases, a rapidly growing number of Army, USACE Districts, and other Facility Owners. We also support thousands of Contractors, Subcontractors, AEs, and Consultants. We have great packages starting at $895.00 for e4Clicks Basic Project Estimator with the RSMeans Building Construction Cost Database, while many of our clients upgrade to e4Clicks Professional Project Estimator, eTakeoff Professional, and the 2014 RSMeans Facilities for $2,430.00. Copyright: © 2011 Pihlak M, et al. This is an open-access article distributed under the terms of the Creative Commons Attribution License, which permits unrestricted use, distribution, and reproduction in any medium, provided the original author and source are credited. The integrated studios in which architecture students are paired with engineering and construction manager students works on the assumption that the common denominator-BIM-is a tool of equal meaning and value to all. This is not the case: each discipline has its own values, procedures, and protocols that bend BIM to its own needs. When these differences are not recognized, design, which has traditionally been the province of architecture, gets short shrift. The BIM process offers the opportunity for cross-disciplinary contamination without sacrificing design emphasis. How to blend engineering student input with architecture student design input so each group learns equally from the other and high quality design outcomes are empowered rather than diminished will be discussed. The integration of Building Information Modeling (BIM) procedures and the consequent earlier and more collaborative interdisciplinary design workflow is changing the nature of architectural design idea generation. The pre-BIM workflow usually consisted of a patient and sometimes solitary search for meaningful architectural form, to an interactive multi-disciplinary group activity where mechanical, structural, electrical, lighting and construction engineers and landscape architects are involved in evaluating and proposing changes to early architectural design ideas and concepts. The ability to recognize the differences between AECO cultures – and hence, architecture with its design thrust – isn’t helped by the fact that efficiency and cost-effectiveness are the banner under which the different disciplines mutually latch onto BIM. While engineering and construction management might legitimately (but also might not, as will be discussed) have efficiency as their primary goal, architectural design does not; what distinguishes architecture from mere building and architects from developers and contractors is the concern for aesthetics and design quality. One could argue that efficiency (in particular in material and energy use as well as operations) should be a criterion of architectural design, but certainly not the only (or perhaps even the most important one). Without emotional and aesthetic impact a building is not architecture. Without consideration and achievement of a certain amount of efficiency or function, there is a real risk that a piece of architecture is a building with an unhappy client. Such unhappy clients may turn to design/build entities (usually lead by contractors or engineers) as a way to get what they perceive as better architectural results. It is our architectural position that the BIM workflow has the potential to positively impact the creation of meaningful architecture. However the nature of architectural idea generation is a delicate process, which does not always benefit from early and quantitatively rigorous engineering analysis. Of course early engineering input can greatly aid the creative development of the architectural design concept. Herein lays the core position of this paper. The BIM workflow shows great promise. Precisely when and how engineering analysis should be brought to bear on the architectural idea will be discussed. Having said this, BIM challenges many of the tenants of traditional “good” design practice, and the manner in which BIM adjusts the process of design needs to be understood, agreed upon, and secured. The unchartered territory has to do with a number of things: BIM software’s general awkwardness with non-orthogonal designs; its potential for collaboration (in the case espoused here, between architecture students and engineering student designers); its ability to conceive/insistence on constructability; the immediacy with which it integrates design decisions with 2-D and 3-D representational output; its access to and limitation of its library of elements. The things in this list that limit ones design repertoire will, for some, be the reason to shun BIM and/or wait for Revit and other BIM software to become more adroit. But this strategy puts design in a passive position, waiting for change/perfection instead of participating in its technically and culturally unfolding context. It is for this reason that, if one is concerned about the quality of design while working in a BIM environment, each discipline might explore the potential for BIM individually. This is not to say that at a point in the future, or at a more advanced stage of a designer’s education, the inter-disciplinary collaborative potential of BIM should be denied; only that the delicacy of design, for now, needs attention as it moves into unchartered territory. While this position of design delicacy affects design strategies in practice, it more directly implies pedagogical tactics in the academy. How does one introduce BIM in schools of architecture as well as schools/programs of building management, landscape architecture, engineering, and other AECO academies, in a manner that supports design? In this regard, it is fruitful to examine studios that variously explore the location of design as it adjusts to the protocols for BIM. Three such studios provide interesting and contrasting examples: the Penn Studio led by Robert Holland, with Ute Poerschke, Madis Pihlak, John Messner and Kevin Parfitt. Columbia University’s Building Intelligence Project (C-BIP) led by Scott Marble, David Benjamin, Laura Kurgan; and the University of Texas, Austin core studio led by Danelle Briscoe. These studios explore the location of design in differing ways, from the most inter-disciplinary example to the most architecture-centric, and offer interesting lessons regarding the status of design. In a prototype Interdisciplinary Collaborative BIM Studio at Penn State, some fifth year and graduate architecture and landscape architecture students worked in multi-disciplinary teams with fourth year architectural engineering students from four different engineering disciplines. (structural, mechanical systems, lighting electrical and construction engineering) This prototype BIM studio has occurred each spring term from 2009 through 2011 . (This BIM studio is currently being integrated into the curricula of all six disciplines as a regularly scheduled alternative design studio). In this studio, three teams of students – each made up of an architect, a landscape architect, and the four types of engineers – were given the same real design project, the “reality” of the project (which is to say, one that was slated to be built) making apparent the multiplicity of players that have input into the making of a project. Each BIM team developed their design project through group meetings outside of studio time and with desk critiques with each of the five faculties. Since for the first two years of the BIM studio only Robert Holland, the Professor in Charge, was given administrative/teaching credit for the class and the other four faculties taught pro bono, not all faculty attended each studio session for desk critiques. On a three week schedule there were formal design juries where all five faculty and invited administrators and real project design, engineering and client participants actively critiqued the student design and engineering proposals. Design quality and overall aesthetic impact, high functioning creative teams and software integration were major focus areas of the BIM studio. BIM workflows and the interoperability of the various software were of necessary concern. The architecture students used Revit, Sketchup, AutoCAD, Ecotect and 3D Studio, while the landscape architect student experimented with Vectorworks Designer, Revit and AutoCAD Land Desktop. The engineering students used Revit MEP, Navisworks(4D and Clash Detection), Timberline (cost estimating), GBS (energy modeling), RAM (structural), Project and Primavera. Learning workshops with Vasari (Beta software) were also conducted with Autodesk representatives throughout the term. With such a complete engineering contingent and only one architect and one landscape architect on each BIM team there was a concern for productive and creative group dynamics. For each of the first two years Professor Sam Hunter of the Penn State Industrial/Organizational Psychology Department led a team of Grad students to study the functioning of the creative design teams. The most interesting finding was that the teams that were able to manage a certain degree of conflict lead to the most innovative architectural, landscape architectural and engineering solutions. The BIM teams that strived to minimize conflict produced the least innovative designs. Dr. Hunter’s team also found that stressing the equality of expertise of each of the student discipline areas lead to the development of the most creative learning environment. The importance of each of the student expertise areas to actively promote their area and then to be mature enough to compromise when necessary lead to the best solutions. Again, too much compromise lead to less than optimal design solutions. Finding the balance of just the right amount of conflict proved to be one of the determinants of a successful creative design solution. In comparison to the traditional architectural studio, early engineering and landscape architecture advice to aid in the development of an architectural design concept sped the design process. Likewise, the collaboration between the designers – landscape and architecture – and the engineers was productive when two conditions were met: when the designers were strong and confident and when the engineers were flexible enough to fly with the non-linear creative process. But in the other cases, the designers floundered with the need to explain their sometimes poorly developed design concepts to four different types of engineers. Either the designers felt the need to absorb the logic of the engineers (which they cannot be blamed for doing poorly) or the engineers could use their quantitative abilities (so much more justifiable than the subject product in of design) to overwhelm the formation of a concept (Figure 1,2,3). Figure 1: Robert Holland Associate Professor, Architecture and Architectural Engineering leading BIM studio students in a discussion in the Stuckeman Center, Stuckeman School, Penn State. Figure 2: Students of six different disciplines present their project to invited guests form practice and academia. Figure 3: Digital models used in a project by different disciplines (from top left to bottom right): coordinated model, construction scheduling, structural analysis, energy analysis, coordination of structure and mechanical systems, architectural models. The Penn State Interdisciplinary Collaborative BIM Studio has won a NCARB Award (2011), an ACSA Award (2010) and a National AIA Award (2009). This fourth semester studio in a 3-year MArch program, as student’s transition from the core sequence into advanced studios, combines three traditional studios (hence the three instructors) and employs outside consultants from environmental studies and engineering. In addition, the studio builds on the ideas, expertise, and suggestions coming from the “Think Tank” symposiums that include all the players of the AECO industry as they gather around BIM capabilities. As the brief says, “The single critic/single student/single project model of architectural education can no longer address the design potential found in the complexity of projects or the increasing role that collaboration will play in future practice.” The students are given existing buildings to modify for environmental updating. In the first phase, students are asked to design components or “Elements”, designed in CATIA and documented with a design manual that can be attached to the building’s skin roof, or ground plane and will adjust the building’s environmental performance. These components form a library of elements available to all students in the studio in the second phase, in which the students form groups and establish their “Integrated Building Strategies,” consisting of combining and synthesizing elements from the first stage library into a parametric building solution. These strategies, like the Elements, are intended to be flexible and reusable. Because the Elements can be adjusted to the new groups’ concept/strategy only by the original author, who has to be responsive to the request for modification while adhering to the parameters that initiated its creation, collaboration happens in two ways: the original Element author adjusting his/her element according to new demands and each student participating in a team that forms its Strategy for building performance renovation. The final project is thus a collaboration of various authors who maintain an individual sense of authorship while taking advantage of the wisdom of many. In comparison to the Penn State Architecture/Architectural Engineering Integrated Studio, the Columbia architecture students utilized the information of the non-architecture AECO industries via the consultants attending the Think Tanks and the studio, leaving intact the design-specific method of architects. However, much else challenged the nature of traditional design methodologies: the collaboration and sharing between architects; the inability at all stages of starting from scratch, since the program was on existing buildings, the Elements had to function according to environmental criterion, and the eventual Strategies were compilations of ideas/forms generated by the elements. The strongest projects at the Element level were those that did not forget all of the other things beyond function and adaptability that make good design: appropriate scale of solution to problem; scalability in general; elegance; context. Likewise, the input of environmental and structural engineering, made the performance –driven nature of this problem richer, but did not determine for better or worse the quality of design; it merely changed its content. This studio, taken concurrently with a Visual Communication course, was offered for 1st and 2nd year students who are taking the first of a seven-semester studio sequence and who have varying degrees of design and drawing experience, some with no design background at all. The students are given a typical design problem of designing a building that must be responsive to program and context, with two initial exercises: the first was the analogue design of a canopy design, its mechanism, and its relationship to a wall. The second digitized this and brought it into BIM. The rest of the semester was spent developing the wall system as it applied to the building in its urban site. After the initial analog design of the canopy, all else is designed in Revit, where the aim was to avoid separating parametric modeling from BIM and to take advantage of the “optimized geometry” when parameters were set up for the performance of the components, their relationship to each other, and their interaction with the building and site as a whole. The challenge was to see how students new to design would handle the potential overload of information as they established a concept and developed them into spatial ideas. Danelle Briscoe indicated that the students were not inhibited by the amount information and took particular advantage of the representational ability of Revit, both in 2-D representations and in the physical models facilitated by the workflow between BIM and fabrication methodologies (laser-cutter; 3Dprinter, 3-D scanner); that they had more sophisticated designs as a result of the construction information required of their design decisions; and, as a result of these two conditions, they produced work more sophisticated than the norm for that level. At the same time, she indicated that the complexity of the software makes it desirable for a separate instruction prior to or parallel to the studio. In this case, there was no desire to mine BIM neither for its interdisciplinary nature nor even for it collaborative, sharing capabilities. Rather, the imperative of constructability – that means that lines can’t be drawn innocently; the power of 2-D to 3-D to 2-D – that makes architectural representation not just sophisticated but information heavy; and the parametric possibilities of Revit without recourse to other parametric software – were tested. In this, the students were not given the same depth of “content” of the two other studios discussed, but the essential tools of design were transformed from something moving from general gesture to specific detail to something moving, like the Columbia studio, from buildable part to overall building/site design. In this, the natural limitations of such a process – the ability to think more abstractly – is understood by the teacher, but needs to be grasped and overcome as well by the students. The strongest designers, again, will be those that latch on to the power of the new, bulky information while also being able to step back and see the success of design solution as a whole concept – integrated, appropriate, elegant, coherent, and diagrammatically clear. Likewise, despite that fact that collaboration was not a primary agenda, the students grasped the advantage of sharing knowledge, sources and design, such that the success of one’s project was not predicated on originality, but rather on access to and judgment regarding choices. As discussed, the Penn State, Columbia University, and UT Austin studios’ primary aims in using BIM to advance design competence were very different. The Penn State studio focused on robust engineering integration with landscape architecture involvement; the Columbia studio focused on design collaboration; and the Austin studio on the formal possibilities for an individual designer. The Columbia Studio concentrated on renovating existing buildings; the Austin studio on developing buildings from scratch and Penn State used real building projects, with design juries with the architect of record and their engineering consultants. The Columbia studio emphasized environmental parameters; the Austin studio, the geometry potential resulting from programmatic and site parameters and the Penn State studio emphasized detailed engineering integration. Thus, one cannot draw any singular conclusions about how “design” with BIM can/ should be taught in an architectural school. 1. The three studios indicate that BIM can be incorporated successfully at either the upper or lower level of design education. 2. They show that the two main aspects of traditional design – singular authorship and a formal abstraction dependent on limited information – may rightfully be rethought as sine qua non of design education. 3. They indicate that design sensibility is not aided by or thwarted by BIM. Briscoe emphasizes that while BIM helped the students visualize their decisions, it neither made “design” automatic nor took the place of aesthetic judgment. Marble/Benjamin/Kurgan implicitly indicate this by not making the studio about design invention (supposedly happening elsewhere in their education) but rather affective performance. The Penn State studio had somewhat weaker design teams and somewhat stronger design teams. 4. Columbia and Austin concentrated on the creation of components as the starting point of BIM design. Penn State benefited from professional engineering students who created original engineered design solutions. This is both a comment on the limits of the existing BIM library and an indication that BIM’s greatest potential at this stage is in the small scale, where the specifics of performance is able to be intimately navigated and the limits of formal synthesis (the inability to easily blend wall, roof and floor, for example) less immediate. 5. The studios indicate that collaboration is facilitated by BIM. While this was clearly the goal and stated pleasure and success of the Columbia studio, Briscoe indicated that the “open source” attitude of the students and the facility to share with BIM meant that without specific direction, the students shared their knowledge and resources. The Penn State BIM Studio benefited greatly from busy professionals making time to attend multiple design juries. Additionally, the case can be made that engineering and building management will move towards an engagement with design. The point of saving design within architecture is not to keep either architecture or design in a privileged position, but to realize that all the AEC players contribute to (a larger definition of) design. If this occurs, design not only will NOT be sacrificed, but enhanced, and all players will be in a position to think about quality, not just quantity; to think about innovation and risk, not just cost-effectiveness. The reality is that these disciplines already play this role more than we have traditionally acknowledged, and as we understand instead of challenge each other’s contributions to design thinking, we displace prejudices that benefit no one, least of all the quality of our buildings. ‘The Penn State BIM Collaborative studio was generously supported by the Bowers Fund for Excellence in Design and Construction of the Built Environment; the Thornton Tomasetti Foundation and the Leonhard Center for Enhancement of Engineering Education. With the exception of the Professor in Charge, all other faculty donated their time. Deamer P, Bernstein PG, eds BIM in Academia. Yale School of Architecture, New Haven, CT, 96. Eastman C, Teicholz P, Sacks R, Liston K (2008) BIM Handbook, A Guide to Building Information Modeling for owners, managers, Designers, Engineers and Contractors. Hoboken, NJ: Wiley. 2The first year involved an elementary school with a real site, which was never built due to concerns over the subsurface super fund site. The next year the new campus early childcare center was chosen as a design project. The third time another elementary school was chosen in the State College School District. The two later sites allowed extensive interaction with the consultant team of architects and engineers. BIM (Building Information Technology) and THE CLOUD (Cloud Computing) are disruptive technologies converging to significantly alter traditional construction and facility management practices. Both technologies also embed associated business process rules and components which will enable enhanced life-cycle management of the built environment, alignment of structures with organizational mission, and better consideration of general community impacts. The ever increasing competitive financial and environmental landscape are requiring public and private institutions to further maximize facility planning and management. Leading organizations are already investing in the formalized definition and creation of robust business process frameworks, cultures, workflows, and capabilities to support collaboration, continuous improvement and/or LEAN practices needed to achieve higher productivity within the Architecture, Engineering, Construction, Owner and Operator (AECOO) sector. BIM and THE CLOUD provide the digital backbone to support the cost effective, scalable development and deployment of adaptive and efficient facility life-cycle management practices. Building Information Management (BIM) is the life-cycle management of facilities supported by digital technology. the Integration of currently disparate business processes and knowledge domain specific software applications such as; Capital Planning and Management Systems (CPMS), Computer-Aided Facility Management (CAFM), Cost Estimating and Project Management, Efficient Construction Delivery Methods (IPD-Integrated Project Delivery, JOC-Job Order Contraction), Computerized Maintenance Management Systems (CMMS), Geographic Information Systems (GIS), and Building Automation Systems (BAS). 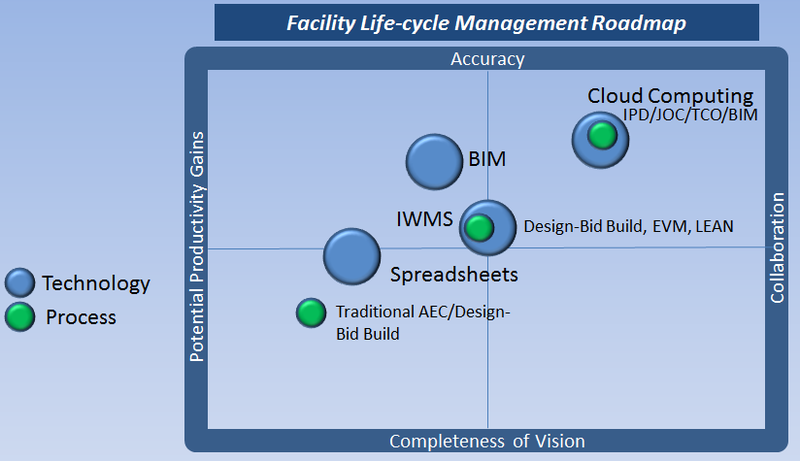 A view of how these components pertain to an overall BIM strategy and facility life-cycle is represented in Figure #1. BIM holds many of the keys to restructuring and dramatically improving overall performance and productivity within our industry, however, cloud computing is equally important. • On-demand self-service: a user to can sign up and receive services without delay. levels and/or storage levels vs. time. 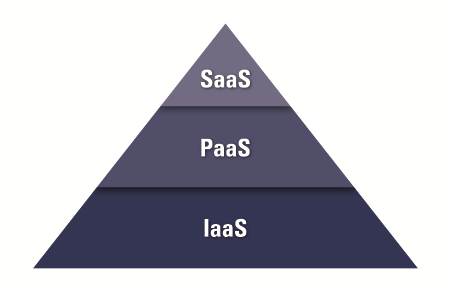 – Software as a Service (Saas): SaaS is the “end-user” level of cloud computing. Access to software application, such as Microsoft Excel for example, is provided on an on-demand basis via a web browser. Applications are available via the Internet on a “right to use” and “pay-as-you-go” subscription model. There is no additional annual fee for software maintenance, or any need to worry about upgrades or patches, etc. Users simply pay a monthly or annual fee for access and use based upon time and/or usage. – Platform as a Service (PaaS): PaaS is the set of tools and services designed to make coding and deploying SaaS applications efficient. While transparent to most end-users, it is the power to create and deploy applications exponentially faster within a standardized, secure environment that is driving the adoption of THE CLOUD. – Infrastructure as a Service (IaaS): IaaS represents all the associated hardware and software infrastructure – servers, storage, networks, and operating systems. To better understand the explosive power of mixing BIM and CLOUD relative to removal of the traditional process and technology silos within the AECOO sector that have held back productivity improvement for decades, it’s important to look at cloud computing in a bit more detail. SaaS is tailor made for applications where there is significant interplay between the user organization and the outside world. Applications that have a significant need for web or mobile access. Software where usage may be intermittent, and or demand spike occurs frequents. All of these are common within all phases of construction, repair, renovation, or sustainability projects. PaaS, platform as a service, also offers several key capabilities. Tools and services to test, deploy, host, and maintain applications are provided within one integrated development environment. Brower and/or web graphical user interface (GUIs) creation tools are also a part of PaaS platforms to speed the ability to create, modify, test and deploy client-specific applications. All of the above is accomplished within a “multi-tenant architecture” within which concurrent developers work within the application. This translates into the ability to build and deploy massively scalable, secure applications at a fraction of the time it would have taken for traditional software deployments. Additionally, this is all accomplished within a set of common standards, assuring the ability to “talk” to virtually any other application. Multiple developers can be working on a development project and/or other external parties can easily become part of development process. This ability is critical where multiple professionals have existing data sources – cost data bases, project information, contract information, etc. and need to enhance the ability to pull and maintain knowledge from these sources. A notable example of a PaaS platform is Microsoft AzureTM. From a facility life-cycle perspective, imagine the following within a BIM environment. Again, please keep in mind that BIM is not “just” 3D model-centric visualization or rendering of building information, but rather collaborative access and ongoing use of a wide range of building information throughout its life-cycle: cost data, physical or functional conditions, utilization, life/safety, sustainability, etc. Cloud computing allows facility stakeholders throughout the world to work concurrently upon the same data. For example, let’s us take the creation of cost estimate for a major facility renovation. The renovation is located in a foreign country, however, part of a large real property portfolio owned and managed by an Owner based in the United States. Anyone that is proposed to participate or participates in the project and simple by invited by the Owner, and or the Owner’s representative. The invite is sent directly from the SaaS cost estimating and project estimating program, and/or adaptive construction project delivery / adaptive construction management system (ACMTM, APDTM, ). The invites can be sent in any language automatically. Invites allow access to information to a specified level of granularity and/or to a domain Once invited, and upon acceptance and confirmation, the invitee will see only the subset of information enabled by the “host”. Perhaps the Owner is providing full access to a general contractor, or the general contractor may be providing limited access to a sub-contractor. Invited parted may be allowed to conduct work on the information, such as prepare a construction cost estimate, and/or work jointly upon an existing cost estimate. Regardless, changes can be made at any time, and at any level, as defined by the account administrator. Each change can be done in locate language, currency, etc. Each change is automatically recorded and tracked right down to time and user, with full “undo” and “redo” capability. This is real-time collaboration and transparency. This is BIM. 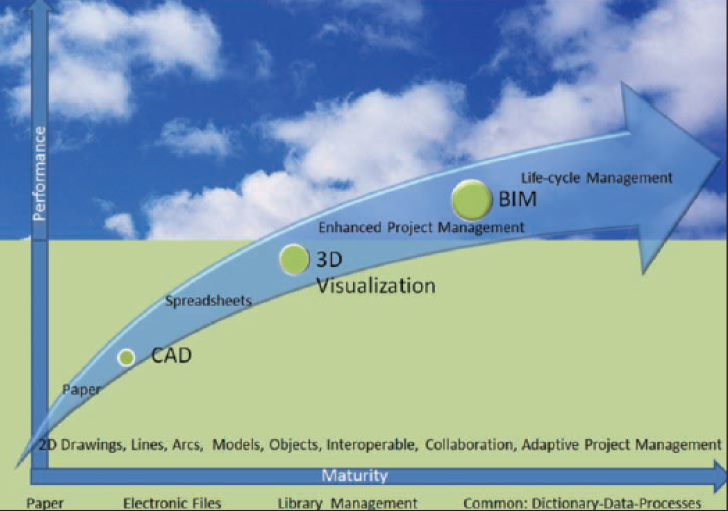 The above only begins to relate the enablement provided by the BIM/CLOUD convergence. 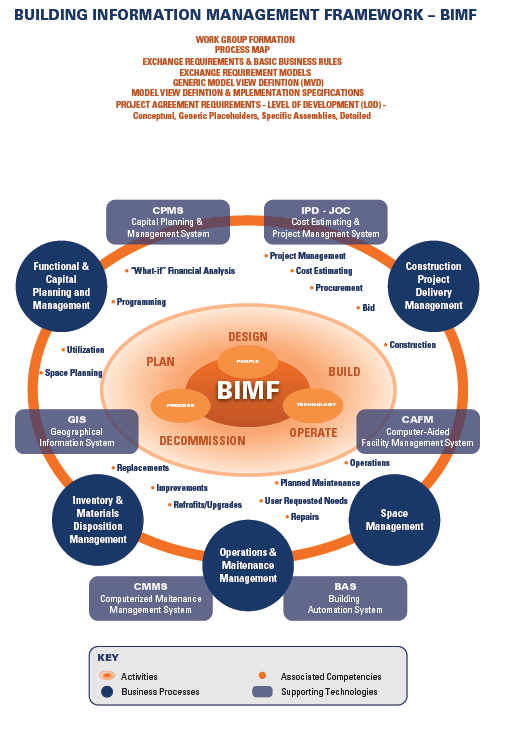 All aspects of a BIM strategy or BIM framework, as portrayed in the Figure #1, can be cost effectively implemented and supported by a digital BIM/CLOUD framework. As the technology solution provided by cloud computing enters the AECOO sector, standardized life-cycle process definitions and associated exchanges of information take front stage to insure that various domain-specific meanings are consistent and apparent at all levels of granularity. Robust, proven business process, such as efficient project delivery methods such as IPD-Integrated Project Delivery and JOC-Job Order Contract will be easily and cost-effectively implemented and consistently deployed throughout organizations regardless of type or location. Owners, AEs. Contractors, and Subcontractors will be empowered to access and use these and other methods to significantly improve collaboration and productivity. Furthermore, changes can readily be made to both processes and technology to adapt to specific localized requirements and/or to keep paces with dynamic conditions. That fact that business process and workflows of these efficient project delivery methods, and all other components of a BIM Framework, are embedded into the cloud technology is central to the empowerment and success of all built environment stakeholders. Using traditional technology and methods, these capabilities would be limited to organizations that could afford the associated “front end” implementation and ongoing technology and process management costs. And even then, success would not be assured as collaborative and “real-time” monitoring, as well as adaptive response are not readily available. Cloud computing technology enables the rapid development, deployment, and ongoing adaptation of proven, robust BIM processes. It is the consistent, collaborative creation and ongoing use of facility life-cycle information for both new and existing buildings, spanning design, procurement, construction, renovation, repair, adaptation, and deconstruction that defines BIM. Cloud technology is the framework upon which BIM processes will be created, deployed and maintained. BIM and Cloud Computing together will significantly expand the ability of all stakeholders to more efficiently better the built environment on a widespread basis. Once sequestered in silos – Owners, Real Property Managers, Facility Managers, Architects, Engineers, Contractors, Sub-contractors, Operations and Maintenance, Financiers, Safety and Security, Business Product Manufacturers, and Oversight Groups – will now have the ability to base their decisions upon transparent, common information. The terms “facility” or “facilities” are used to define vertical (buildings) and horizontal (bridges, roadways, utilities…) built structures. 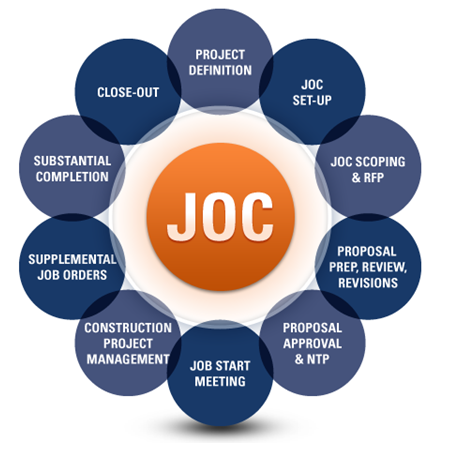 Job Order Contracting (JOC) is an form of Integrated Project Delivery for facility renovation, repair, and sustainability construction projects. Both IPD and JOC are decades old and proven to be effective at improving productivity and mitigating both change orders and litigation.